Spring is springing in Delhi – the weather is getting warmer, people are outdoors without scarves and sweaters, and a few hungry mosquitoes are starting to make unwelcome cameo appearances in the evenings. Spring from Vivaldi’s celebrated work The Four Seasons is light and full of the sounds of new life — birds calling, flowers unfurling — a literal breath of fresh air after the long winter. This conception of spring picks up on very different elements than the ones we typically do in the west (though one could argue that perhaps Stravinsky’s Rite of Spring is closer to this sound world). 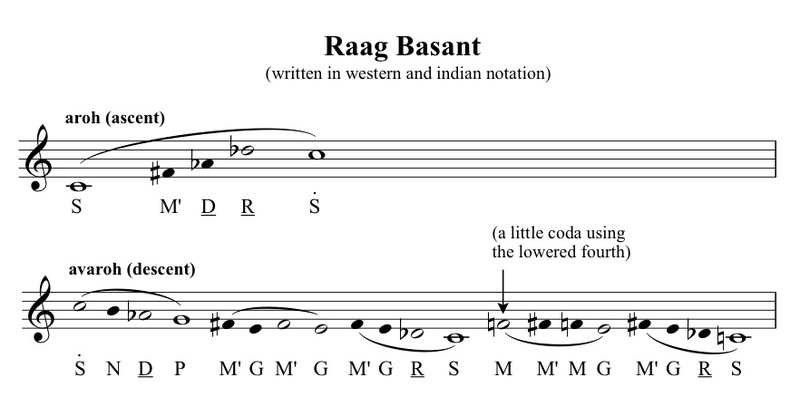 At least to my western ears, the raag sounds darker, more sinuous and less peppy. The way I’ve written it out, the white notes are a little longer and weighted more – it’s hard to notate this exactly, but this gives you a sense of the hierarchy of the notes. My favorite part is the coda at the end of the descent, with the natural fourth. Those last two phrases are very soft and intimate, and feel almost like a beautiful whispered secret to me. There is no doubt that various musical cultures have evolved to attribute certain sounds to certain events or feelings. As a western musician, I have constantly wondered whether there was something inherent in certain sounds that begged specific emotions, or whether the pairing of particular sounds with the same emotions over generations created a sort of Pavlovian effect on the culture of listeners. For instance, the first time someone heard the I-iii-I-iii chord progression, did tears well up in their eyes? Or was it the constant pairing of that with sorrowful parting scenes in movies that made an audience (largely unaware of the progression’s musical mechanics) respond predictably to it on a purely emotional level? Brought into this context, I wonder if spring just brings up a different range of associations for Indians than it does for westerners, whether the same associations are expressed differently in music, or some combination of both. In any case, as the birds create a racket on my air conditioner and my scraggly bamboo plant is visibly encouraged by the extra hours of light, I will be thinking of both Vivaldi and Raag Basant this year. This entry was posted in Uncategorized and tagged affect, hindustani music, raag basant, spring, western music. Bookmark the permalink.